There are spots on earth marked by churches and temples built on the remains of far more ancient temples. Why are sites like Giza, Angkor Wat, Kura Tawhiti in New Zealand, and Stonehenge so powerful? Why is Mount Fuji sacred? 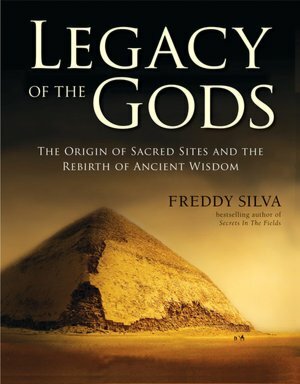 Silva presents an unfolding exposition of lore and science that explains the mysteries that make these sites so potent. He gives compelling evidence for the reason particular sites were chosen. Furthermore, the author shows how these sites were systematically connected across continents and around the globe following ley lines and intertwined yang-yin ley lines that culminate in power omphalos or navels. In the second part of the book, Silva shares seven key principles that underlie the locations and construction of these temples. The book is richly illustrated with black and white photographs of sacred sites around the world and maps showing their interconnections. Silva supplies an analysis of the earth-and-sky derived latitude and longitude numerology that underlies the design of these buildings and their locations. New scientific analyses and archeological finds supplement previous information about the world’s power sites. Silva posits that the origins of temple-building technology was preserved and reseeded after the Great Flood in 9703 BCE. While many sites were lost underwater, an interconnecting web of power spots around the earth were systematically located and temples constructed on an epic scale circa 8000 BCE. What makes this book even more fascinating is the explanation of the purpose of these temples. Their relationship to the condition of the land and the welfare of the surrounding communities (cities, nations) extends far beyond their utility as ancient astronomical calculators. The real power of these sites lies in their capacity to create and retain a beneficial attunement of the sky, land, and the people. And here’s the rub - as a plant dies if it’s not watered, the misuse or failure to maintain the attunement of these sites has devastating consequences: violent weather, climate shifts, and the destruction of the surrounding civilizations through political corruption and war. Sound familiar? The current state of global political and ecological degeneration makes these assertions ring true in a profound way. It is up to the reader to decide whether s/he agrees with Silva’s explanation for the origins of this ancient technology. Much has been written about sacred sites since the 1960s, and has been interspersed with stories about aliens and other speculative theories that stretch credulity to the breaking point. This book offers the best holistic responses to the controversial questions surrounding the origin and purpose of these sites, and is a superb next-gen answer to Erich von Daniken’s Chariot of the Gods, published in 1968. Silva’s combination of extensive research and new science is much more plausible, although von Daniken gets credit for opening up a dialog on the subject. As I was reading the book, I realized that this is the stuff that scientists and governments really don’t want people to know about. If humanity is to evolve past the horrors of current global rapine and misery, the revival and attunement of these sites is the key. Beautifully written and generously illustrated, Legacy of the Gods supplies a kernel of hope for those of us who despair at the condition of humanity and the earth. It offers a preliminary blueprint for the healing of it all, a means of global restoration that is stunning in its scope and breath-taking in its actual viability. Top marks – highly recommended!